gunsnfnroses: Slash and The Conspirators on Jimmy Kimmel Live! Tonight at 12am EDT, Slash, Myles Kennedy and The Conspirators, will appear on ABC’s Jimmy Kimmel Live! The band will perform a mini-concert on the talk show’s large, outdoor stage that will include current single, “You’re a Lie," as well as 5 more songs from their forthcoming Apocalyptic Love LP. The band just wrapped-up filming for the "You're a Lie" music video, with director Anthony Leonardi III, who is also directing Slasher Films' Nothing to Fear. "You're a Lie" was shot on the original Phantom of the Opera soundstage at Universal Studios in Hollywood. 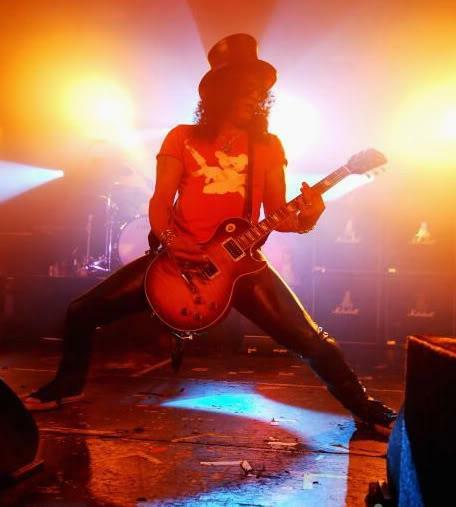 Tomorrow night (April 11), Slash & Co. will perform live on Revolver's Golden Gods Awards. You can watch the awards show here, tomorrow (April 11) live and for 24 hours after the broadcast. Duff McKagan will also appear at The Golden Gods, to present the award for "Riff Lord." The 2012 Rock N' Roll Hall of Fame induction ceremony, featuring whoever from Guns N' Roses decides to show up (Slash, Duff, Matt, Steven and ... Axl? Izzy? Dizzy? ... we'll see. Watch this space for further developments as they develop.